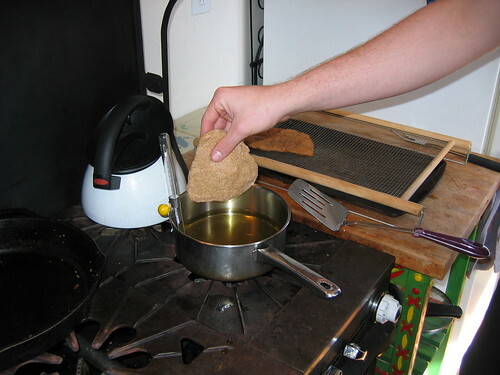 The bread is described as “a large, raised square of light brown dough”, and Vlad enjoys eating it, alternating bites of bread with bites of garlic. Since biting into a raw clove of garlic doesn’t appeal to most of us, I opted for the joy that is roasted garlic. And, just to give it a bit of that Eastern pizzazz, I sprinkled a bit of zaatar (a middle eastern spice) over the top of it. Pure culinary bliss. Even if you aren’t enjoying your last home-cooked food before marching off with an army, this bread is wonderful. Roasted garlic, if you’ve never had the fortune of encountering it, has all those wonderful garlic flavors and aroma combined with a sweetness from the roasting process. I sometimes eat it with a fork, straight from the bulb. Spread out on a piece of this flatbread, with some spice and salt sprinkled over top, the roasted garlic is delicious. The bread is so soft, fluffy, beautifully seasoned, I’d happily have this for/with lunch several times a week. Make the dough first: combine the water, yeast, flour, honey, and salt. You may need to add a little water or flour to get the dough just right. The consistency should be very gooey and sticky. Transfer the dough to a large clean bowl, greased with a little olive oil, and allow to rise for several hours, or overnight. 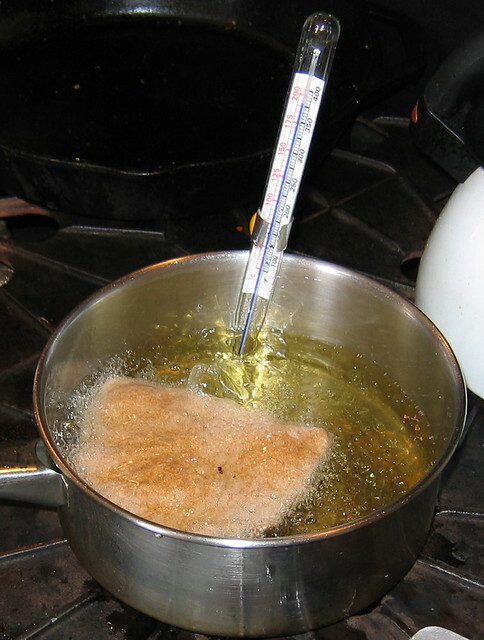 Heat about a teaspoon of olive oil in a large frying pan over medium-high heat. Tear off a piece of the risen dough, and toss it with flour to diminish the stickiness. At this point, you can either roll out the piece of dough, or flatten it with your fingers, like a tiny pizza. Either way, the dough should be no more than 1/4″ thick, and not larger than the bottom of the pan. Carefully place the dough in the frying pan, and shake the pan back and forth to make sure the dough is covered with oil, and not sticking. Let this fry for around 30 seconds, or until it only gives slightly when you squeeze the sides with a pair of tongs, and before it starts to bubble up. 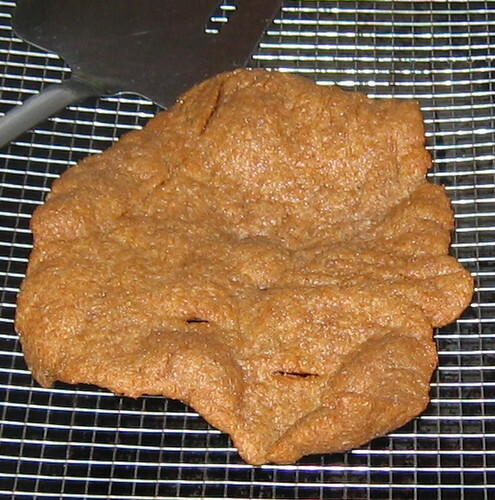 Flip over; the dough should be a light brown color. Let the second side cook for around the same amount of time: This part of the recipe is more art than science, but both sides should be a light brown, and the inside should be cooked through, but still soft. Remove to a plate covered with paper towels to drain off excess oil. 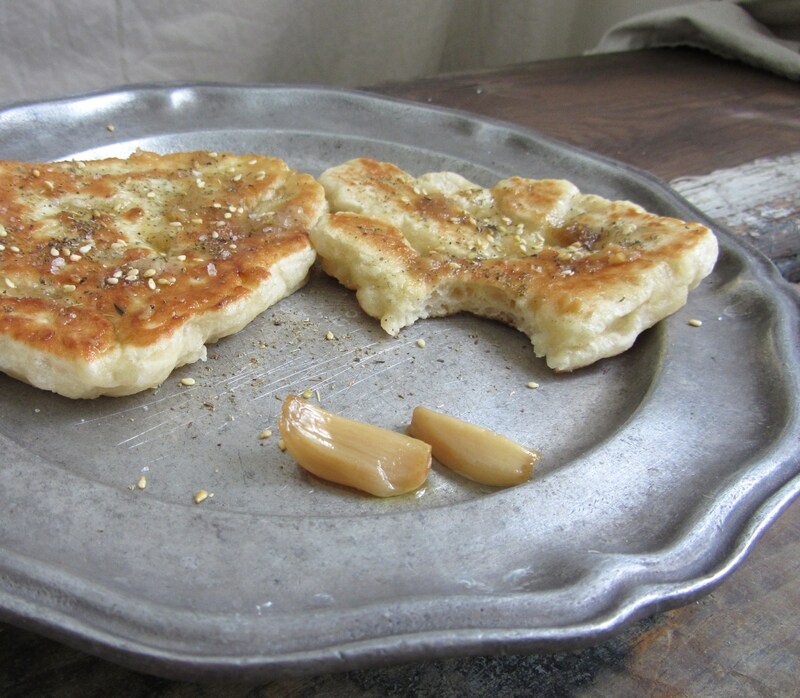 Spread a clove of roasted garlic on each piece of cooked flatbread, and sprinkle with spices and/or salt to taste. Serve while still warm. Chop off the papery skin on top of the garlic bulb, so that you can see the individual cloves (see great photos here). Drizzle some olive oil in the top, and wrap the whole bulb in tin foil. Roast in a 400 degree oven for around 30-40 minutes, or until the cloves feel soft. Allow the garlic to cool enough that you don’t burn yourself before handling. You can peel the leftover roasted cloves, place them in a jar, and cover with olive oil. Stored in the fridge, they last several months (or more), and are ready at your beck and call. 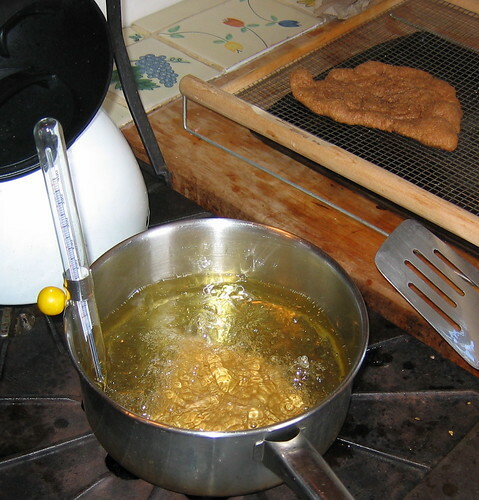 What’s more, the olive oil gradually becomes infused with the garlic flavor. Win! This is delightful! Thank you. What Vlad is eating (in my head, of course, which is no more legit than what’s in yours) is Hungarian langos (pronounced LANG-ohsh), which is actually a deep-fried (or sometimes pan-fried) potato bread. It’s traditionally sold by street vendors in working class districts and, yes, eaten with raw garlic. Biting into a piece of raw garlic is, in fact, too intense–so you follow it with a bite of bread just as the intensity is building. It’s an amazing experience. None of which is intended as criticism or correction of your version, which seems wonderful (and is flattering as hell). And, really, who could ever say no to roasted garlic? If you are near Menlo Park, CA, Applewood Inn does a fabulous traditional langos! I made this last night and it turned out wonderful. I substituted half of the flour with whole wheat and honey with agave syrup (my honey crystallized and I didn’t feel like fighting with it.) Topped with zaatar and roasted garlic, it was delicious!